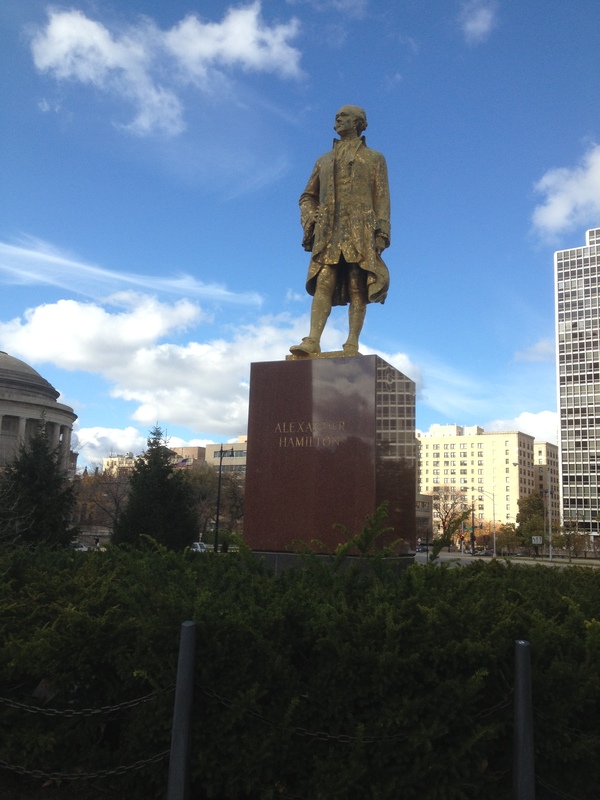 Images of Hamilton: Alexander Hamilton Memorial Statue in Chicago – It's Hamiltime! If you’ve visited Chicago, you may have noticed a gilded statue of Alexander Hamilton in Lincoln Park. The sculpture was commissioned by Chicago heiress Kate Sturgis Buckingham and designed by British sculptor John Angel. Kate was the daughter of Ebenezer Buckingham, who made his fortune in grain elevators. She never married and devoted her time to philanthropy and public art projects for the city, including the famous Buckingham Fountain. Time Magazine stated in a 1951 article that Buckingham had “two consuming interests: art and Alexander Hamilton.” Buckingham considered Hamilton “one of the least appreciated great Americans.” She felt that “Hamilton had secured the nation’s financial future, making it possible for her own family to make a fortune.” Prior to her death, Hamilton commissioned the statue from Angel and envisioned a massive setting. She commissioned artist Eliel Saarinen to design a massive, 80 foot column to go behind the statue. However, this proposal was not well-received and the setting was never completed. Buckingham died in 1937 before the statue was completed, but she left $1 million in her will to the Art Institute specifically to create and maintain the Hamilton Memorial. The Art Institute trustees were not particularly keen to complete the work according to Buckingham’s vision, and Buckingham’s trustees eventually had to take them to court in 1951 to have the statue and setting completed. The court ordered the completion of the monument by 1953, and the Art Institute commissioned Samuel A. Marx to create the setting. For a more detailed description of the history of the Chicago memorial from an architectural point of view, see Andrew Raimist’s blog, Architectural Ruminations. And for more images of Hamilton, check out the AHA Society’s Hamilton desk calendar.